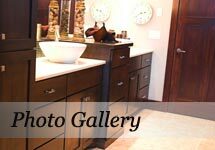 Sioux Falls Kitchen & Bath is a custom cabinet maker and millwork supplier. SFKB provides high quality custom cabinetry and millwork to many of the area’s top builders. At SFKB we believe the kitchen is the heart of the home. When you are looking to build or remodel your home let our designers assist you. They are experienced in creating the type of kitchen environment that is not only functional but provides a comfortable place where families gather and life long memories can be made. We understand that the process of designing your dream kitchen can be exciting but a bit overwhelming. The process starts with the layout and overall kitchen design. Once the layout is in place we will help you sort through the vast range of options to come up with the perfect combination of wood species, door styles, finishes and accessories that will bring your dream kitchen to life. If it’s millwork you need we are an authorized JELD-WEN (http://www.jeld-wen.com) dealer giving us access to high quality stair parts and millwork including interior & exterior doors in many different styles built to meet a wide range of applications. We also have access to custom millwork should you desire a specific profile for your case and base. Most millwork suppliers do not handle the stain and finishing process but rather send the product out to a paint shop. Because of SFKB’s association with Wiley Painting and the fact that the two companies share facilities the staining & finishing process is seamless. Once the millwork product reaches SFKB it does not leave again until it is finished and delivered to the job site. This reduces the amount of handling and exposure to damage. In today’s hurried society we understand that your time is precious. It is the goal of SFKB and Wiley Painting to alleviate the headache of dealing with multiple suppliers. Aside from the fact that our products and services are of the highest quality an advantage of working with us is we are a “one stop shop”. We can supply you with all of these building products rather than wasting time going to multiple suppliers. SFKB and Wiley Painting are committed to providing the highest quality custom cabinetry, millwork and painting backed by excellent customer service.